Take a seat and find out what the best armchairs for your home look like in our top picks! You don’t need to be an interior design expert to know that picking furniture for your home is about more than just providing somewhere to sit. Mostly, it comes down to style and the overall look you want to achieve, as well as comfort, size and price. The best armchairs on the market don’t come cheap, so if you’re looking for a high-quality piece, be prepared to look at it as an investment. That’s not to say you can’t achieve a high-end look on a budget. Stores such as IKEA are great for finding quirky statement pieces or comfy basic options that won’t break the bank. For those who aren’t familiar with furniture terminology, you probably don’t care if it’s a Fauteuil, Club Chair or Chaise Lounge. However, these things matter in terms of sizing and logistics as well as being a matter of personal preference. When it comes to the best armchairs 2017 has to offer, the Wing-Back chair is your traditional 1940’s style with a sturdy, high back and arm rests (AKA Wings). The typical image that may spring to mind is a brown leather armchair that looks dated, but with today’s modern twists, these chairs have are extremely popular amongst lovers of all things vintage. If you prefer something more compact and minimalist, this is where the Barrel-Back is a popular choice. 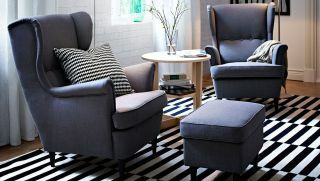 It is yet another homage to the 1940’s, with a rounded back which proves a comfortable option for any room in the house. Or for something a bit softer, the Bergere is a classic 17th-century style chair that is soft and delicate; suitable for both contemporary and period homes. If none of that tickles your fancy, then there are a plethora of modern designs to suit all homes. If you’re starting from scratch, you have free reign, but if you’re adding to your existing décor, consider whether you want to complete a matching set or shake things up with contrasting pieces. Choice of material will depend on your home, as some have removable cushions and materials such as leather are easy to wipe down; perfect for households with children. If you fancy a cosier setting, you could always check out our guide to the best bean bags. You can’t go wrong with this made-to-order leather armchair from Laura Ashley. We love the deep brown colouring with dark wooden legs that would suit a home office or study perfectly. If you already have a leather sofa, then this could be a great addition to your front room or alternatively a striking piece on its own. The cushions are made with fibre seat filling for ultimate comfort, but this requires regular plumping to ensure it doesn’t lose its shape. All in all, with its timeless look and high-end materials, this armchair has huge mileage as an investment piece, giving it our top spot. Although the cheapest on our list, the Strandmon Wing Chair is a great quality piece that excels in both functionality and aesthetics. The neutral grey colouring would complement most decors and the high back doesn’t just look good, but makes it one of the best armchairs for bad backs. If you find yourself fidgeting when you sit down to watch some evening telly, you may find a wingback chair provides more support and comfort. If you’re a fan of simplicity and elegance then this light and airy wooden Marino Armchair by Ercol for John Lewis is a stunning piece of furniture. We think this would suit contemporary homes that have neutral tones and lots of sunlight. The pale tones add a splash of colour to the room without becoming overbearing, and the duck feather pillows make this a super-comfy chair to relax in. Although expensive, the wooden frame is durable and it comes fully-assembled so you can enjoy it right from the get-go. We love the Habitat MOMO Armchair, and it is the perfect solution to adding a splash of colour to any room. Its Barrel-Back style has a gently reclining back providing a great deal of comfort without taking up too much space in your home. Some people have bought this item to match a sofa from the same range but have noted the colours aren’t exactly the same. However, as an individual piece it is the ideal bedroom or office chair which also comes in neutral tones for a more professional finish. Does your room lack oomph? Then make a bold statement with the Habitat Daborn Aztec style monochrome chair. We guarantee this will make any living room, study or bedroom stand out from the crowd, as well as provide a comfy seat when you need it most. If colour isn’t your thing but you want to be more daring with your interior design choices, then this is the best armchair for adding style to your living space. Do you love the idea of filling your home with antiques and old family heirlooms but don’t have the cash to splash? This French Louis Armchair provides a romantic feel that can add elegance and grandeur to your interior at a fraction of the cost. It has been beautifully hand carved and the gold finish completes its period look perfectly; ideal for Period-style homes. Need lighting inspiration? Read our round-up of the best living room floor lamps.